As Brünnhilde invokes the gods of an empty Valhalla for one last time and strides confidently into a wall of flame, we pause for a moment, unsure of what will follow. Wagner’s brass play a grotesque fanfare while the flames consume her, and we’re seized with a sudden dread that all might be lost. And then the water comes—first just a light rain, then a downpour, then a torrent, and finally a flood, washing away all the debris of a fetid Rhine and a fallen world. And the flood recedes into mist, a golden-hued dawn rises, and the curtain falls—for the first time—on our world. Throughout Götterdämmerung and the last act of Siegfried, Wagner exploits the tension between inevitability and the illusion of free will. Wagner’s gods and demigods—Wotan, Waltraute, and the Rhine Maidens—hold out hope until the very end that by blocking Siegfried’s path, or by convincing Brünnhilde to yield the ring, they can revoke Alberich’s curse and restore the world as they once knew it. In the face of their desperate entreaties, Siegfried and Brünnhilde’s impassiveness seems the height of selfishness. Such behavior we might expect from the childish Siegfried, but certainly not the wiser Brünnhilde. But contingency in Wagner’s fallen world is an illusion. Far from selfishness, her refusal to give up the ring demonstrates an awareness that through Siegfried—his slaughter of Fafner, his breaking of Wotan’s spear, his conquest of Brünnhilde—the epochal transition from a world of gods to a world of men has already occurred. All that remains—and Brünnhilde’s position as a “fallen angel” makes her the only figure who can bring this about—is to baptize this new era in blood and fire, to banish the gods forever. The world of gods, for Wagner, was an intermediate stage—necessary in order to build the world and set it in motion, but still fundamentally incomplete. The gods—kept forever young by Freia’s golden apples and immune from fear—could never truly love. And this is why, of course, Siegfried—a stand-in for all of humankind—had to learn to fear before he could know love. Wagner, writing in an era deeply steeped both in Christian symbolism and Hegelian historical determinism, was given to viewing history in ordered stages. Just as the fallen world of the Israelites necessitated but also prepared the way for the coming of Christ, or as the growth of world capitalism necessitated but also prepared the way for socialism in Marx’s Communist Manifesto (written the very same year as Wagner’s The Nibelung Myth as Sketch for a Drama), Wagner’s deities laid a foundation for the world, but could only move it forward through their own destruction. The key challenge of any Ring production is to dramatize this gradual decay and ossification—to lead us, through setting, costuming, and acting from the limitless possibility of Das Rheingold to the scarcity and contradictions of Die Walküre and Siegfried, to the putrescent corruption of Götterdämmerung. All the while the director has to worry about the nesting doll of individual narratives, sounds, and furies, that teem beneath the surface of this grand narrative. Francesca Zambello’s greatest success as director of the SF Opera’s Ring came in managing this huge narrative superstructure. By setting each scene in progressively more decrepit, degraded environments, she was able to maintain a background of the grand narrative while focusing on the granular elements that make the Ring dramatically interesting on a minute-to-minute basis. This technique was on full display in Götterdämmerung.Whether in the opening Norn scene, in which the despondent goddesses sifted through a junkyard of discarded electrical equipment with a circuit board projected in front of it, Gunther’s sparely-appointed luxury apartment overlooking a smoke-belching skyline, or a Rhine choked with discarded plastic bottles, Zambello created an environment of pervasive decay. Perhaps nowhere was her interpretation more effective than in the double wedding scene, in which the unhappy couples were surrounded on all sides by Gibichung men armed with rifles and dressed completely in black. The scene of the apocalyptic wedding invoked the Christian parable of wedding as a metaphor for the end of the world (a theme familiar to anyone who’s heard Bach’s seminal Cantata 140, “Wachet auf, ruft uns die Stimme”). As Götterdämmerung hurtled toward its fiery conclusion, Zambello’s stagings became more and more sparse, primarily using S. Katy Tucker’s projections in lieu of scenery (a barbed wire-protected watchtower with a searchlight as the men left for the hunt, a strip of the same forest where Siegfried slew Fafner as he held forth on his life story with the hunters, or projections of rain and the roaring waters of the Rhine as the world renewed). It was a poignant, non-obtrusive backdrop for a day of vocal performances that saved the best for last. 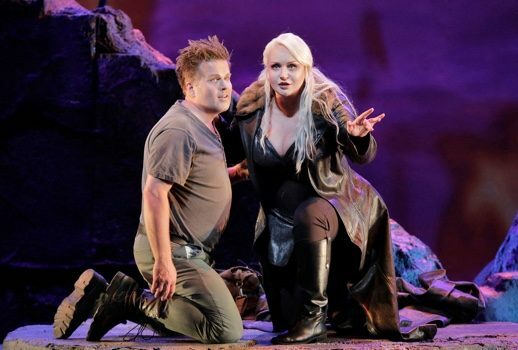 Iréne Theorin did not bring a massive sound to the role of Brünnhilde, but her performance in Götterdämmerung was so nuanced, incisive in tone, and invested that I didn’t miss the big sound at all. As Waltraute visited her mountaintop, Theorin transitioned both vocally and dramatically from a tender, almost sentimental warmth—as she asked whether her sister had come to share in her joy—to haughty pride as she realized Waltraute was only there for the ring. That pride then turned to rapture as she saw Siegfried (or so she thought) coming over the hill, leading to some of Theorin’s most committed, rich-toned singing as she awaited her hero with open arms. During the marriage scene, she demonstrated both a towering concitato rage and a sonorous but contained sotto voce as she consorted with Hagen. The intensity of her under-the-breath singing became all-but unbearable in the immolation scene. As she realized the sacrifice she would have to make, her voice sank almost to a murmur, and was yet so intense as to be readily deciphered. Our frantic, peppy, hipster Brünnhilde took on an aspect of such poise and calm in her final moments that her softer-edged tone portrayed perfectly the majesty of her martyrdom. There is little question that this final installment also evoked the best of Daniel Brenna’s Siegfried. Placed in fewer situations (particularly compared with the brutal first act of Siegfried) where he had to compete with active orchestral textures, his sound was less-forced, more heroic, and bigger. In his Prologue sunrise duet with Brünnhilde, he blossomed into high held notes. Act 3, Siegfried’s great vocal tour de force, was exceptionally well done—he displayed a dashing heroic lyricism in response to the Rhine Maidens’ overtures and, while telling his life story to Hagen, Gunther, and the hunters, gave a well-paced, extemporaneous performance which adapted to the specific character of each of his exploits. His tone lightened notably, for example, as he quoted the advice he had once received from the Forest Bird (in the very same melodic figure). But just as in Siegfried, Brenna’s singing was outdone in Götterdämmerung by his highly detailed acting. his exuberant narrations of his heroic exploits, complete with mock swordfights with Hagen, were a bittersweet swansong for the life of our man-child redeemer. In a cycle full of fantastic villains, SF Opera Ring veteran Andrea Silvestrelli may have been best of all. About seven feet tall, with a big, dark, and direct bass tone to match, Silvestrelli made a hulking Hagen. With his massive stature, he couldn’t help but be the center of attention whenever he was on the stage, but he justified such attention musically and dramatically. A musical shape-shifter like his Ring father, Falk Struckmann, he was equally at home cloyingly pretending to comfort his abused half-sister Gutrune, boomingly rousing the rabble for the wedding, and serving as a mastermind of Siegfried’s death. 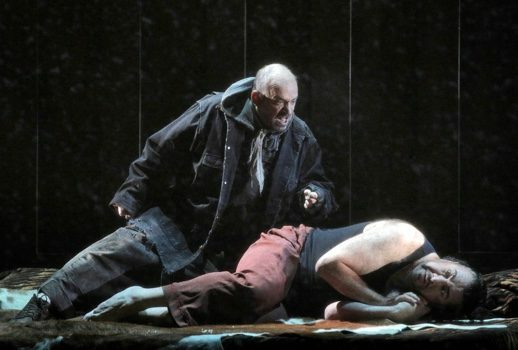 His character’s easy rapport and clear mutual trust with Siegfried, maintained right up until the knife was in the latter’s back, achieved a level of sociopathy that few operatic performers manage. But for the All-Cycle Villainy Award, Silvestrelli has serious competition in Struckmann as Alberich. One of the great (and somewhat discomfiting) mysteries of The Ring is why Alberich, whose avarice sets this great drama in motion, is one of the only beings left alive at the end. Wagner offered no explanation. We may never know. In any case, however, Struckmann’s encore performance as an apparition in Hagen’s dream was masterful. Plying his son to work through Siegfried to regain the ring, Struckmann showed an outstanding ability to be heard at a soft dynamic (while creepily spooning his son in his bed, no less). It was a strange, disquieting, and wonderful scene (made all the better by the man sitting behind me who stage-whispered “Happy Fathers’ Day!” to his opera companion as Alberich slunk offstage). In the role of the (not so innocent) victim of Hagen’s plot, his half-sister Gutrune, Melissa Citro supplied a relatively small voice but big acting personality. From her nervous fluffing of the pillows in her home as Siegfried arrived, to an almost Amadeus-esque laugh as her smitten hero tried to grab her after drinking his potion, she was a worthy acting partner for both Brenna and Silvestrelli, and that is not an easy ask. Vocally she was at her best in the conservatively accompanied final scene, as she (somewhat resignedly) awaited the return of Siegfried from the hunt. Brian Mulligan brought a generous, buttery baritone timbre to the hapless character of Gunther, an all-too-human role who, like his lonely sister Gutrune, is taken in by Hagen’s promises of love, riches, and validation. Mulligan was particularly compelling when he had the voices of Brenna or Silvestrelli as foils. His duets with the latter, contrasting with Silvestrelli’s sinewy basso profundo, were a musical highlight of the first act. And Jamie Barton ranged from heroic pride to deflated grief as she described the felling of the ash tree as the Second Norn, and later served as a compelling Waltraute. Though Barton’s downward leaps could occasionally be lost amid the orchestration, she showed a great sense of pacing as she led the soft brass and timpani accompaniment in the orchestra, and a rich warmth as she told Brünnhilde of Wotan’s wish that the ring be returned. 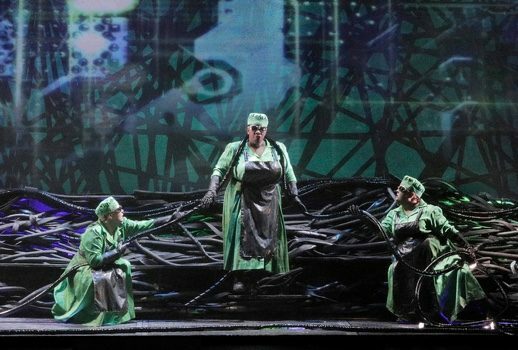 As the three Rhine Maidens, Stacey Tappan, Lauren McNeese and Renée Tatum were by turns charming and threatening, combining their material from the opening of Das Rheingold with the music of the Siegfried Idyll. Unable to overcome Siegfried’s love of Gutrune, the trio were almost reminiscent of the three witches of Macbeth as they tried to ply Siegfried with fear. Ultimately unsuccessful (the curtain came down on Siegfried brandishing his hunting rifle in one hand while emitting a boisterous guffaw), they made a worthy musical pitch. 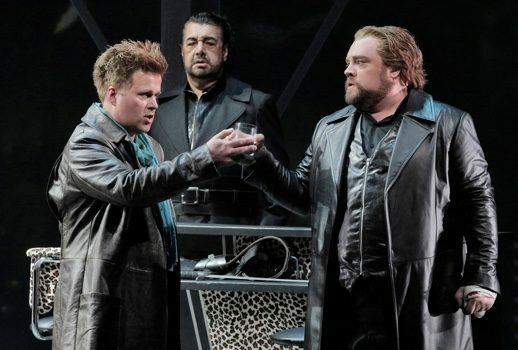 And though SF Opera’s masterful chorus master Ian Robertson didn’t have much to prepare in this cycle, the performance of the male chorus in the wedding scene was notable for its clarity of text and barbaric aggressiveness. So as a little girl in a white dress came out to set a small potted shrub by the side of the stage (a Zambello signature touch), the Rhine Maidens laid down a new carpet of gold, and The Ring’s final soft, iridescent chord trailed off, where did these 15 hours leave us? Zambello and Runnicles’ Ring was a magnificent achievement. As exhausting as it may seem for us opera lovers to sit through a Ring, putting on such a production is an act of almost impossible endurance—mental, physical, and emotional. Over the last few days, I have pointed out occasional imperfections in the singing, playing, and overall conception of the cycle. Performing a perfect Ring Cycle is impossible—the piece is simply too enormous and too demanding for everyone involved. But it is simply too great an artwork not to try. The SF Opera’s Ring was thoughtful, displayed a large-scale conception of the work’s dramatic form, offered us some of the best Wagnerian singing in the world today, and accompanied it with an intense and studied performance by one of America’s best opera orchestras. I would add, as a final thought, that it is heartwarming to me as an orchestra conductor to see the value that the SF Opera places on its orchestra. Not only were all the pit players invited onto the stage for the final bow, but the horn player who “played” Siegfried was even invited to bow with the singers. It was a wonderful gesture and well-deserved. There are very few pit orchestras as good as this one; in the United States only one, perhaps two. And so concludes our septennial San Francisco Ring Cycle review cycle. See you in another seven years!